If you are waiting for something to be initiated, chances are high that others are as well! 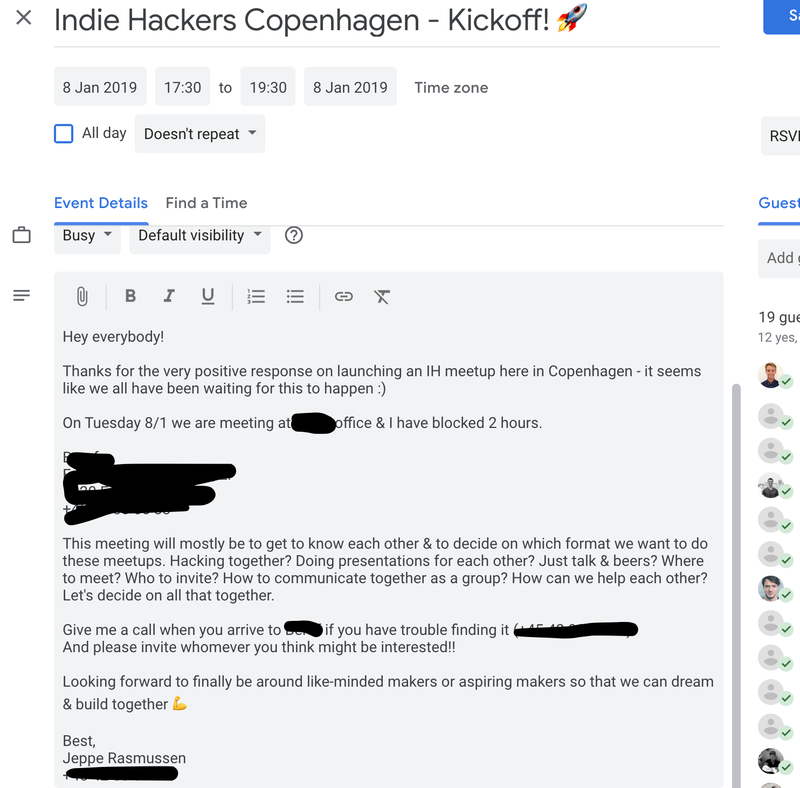 For months have I been reading IndieHackers (IH), but haven’t connected with anyone offline that have the spirit as all online IH readers. Weekly I was scrolling through their newsletter hoping for a meetup in Copenhagen to be arranged, but it never appeared. So I reached out to the 30 people on the platform with Copenhagen in their profile to hear if they were interested. Of the 30 people, 20 people responded positively & 10 awesome Indie Hackers showed up on the day. I had no experience arranging meetups or anything, but the group made it easy. When reaching out initially, a few guys offered their office space to host the event if necessary. All I did was gathering all the interested people in an Airtable & creating a Google Calendar event to send out to all of them. Then I applied to become an Indie Hackers community ambassador which gave me access to a Slack channel where other ambassadors & Courtland shared their experiences. Based on that I noted down an idea for an agenda & waited for Tuesday to arrive. When we all met I quickly realized this was the exact group of people I’d love to build with. They were all so damn different! In their personality, in what they worked with, in their approach to business, in everything (in a good way 😂). 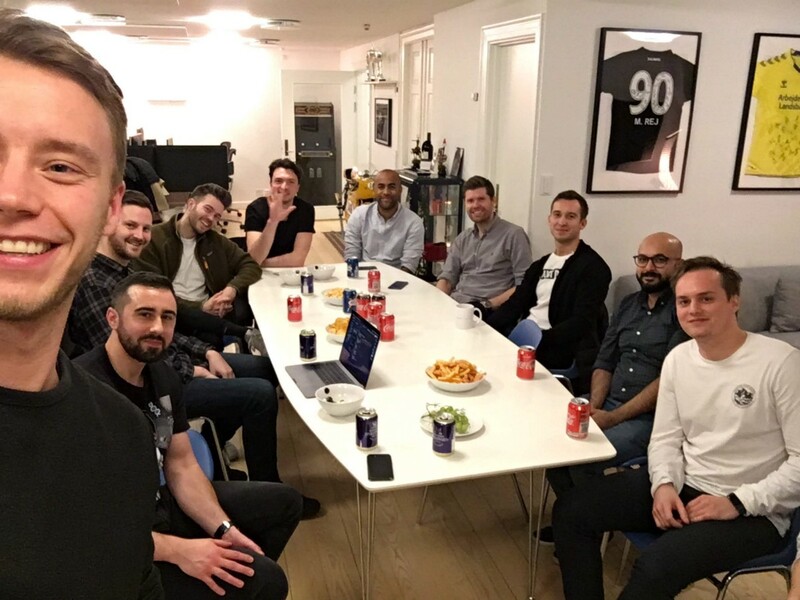 There was a handful of nationalities gathered and projects ranging from Virtual Assistant as a Service to Agile Products to Analytic Services to eCommerce stores and more. I got good ideas on how to hack my way to track own hands while climbing for the AR game by mounting a Leap Motion device to the headset. For the second I got an idea to integrate into another popular application — something I had never thought about before but that could potentially be a great lever for growth. At the meetup people offered their office’s recording studio for someone else to record content for the course he had been planning, one guy wanted to get some last people’s feedback on an idea before he closed it down completely, and much more. So many things that wouldn’t have happened if I had not gathered these people. 1 Who do you want to gather? Now seeing the people introducing themselves in the Slack group we have created & posting links to their projects is just another benefit of this. Everybody is really working on beautiful & functioning products, which really pushes me to set the bar higher for my projects. Let's see where this take us over the next months. I hope this serves as inspiration for you to arrange your own thing or take initiative on x instead of waiting for it to appear.